EUROPE: Floating foundation specialist Principle Power has joined the pan-European project to accelerate development of Senvion's 10MW-plus offshore turbine. The project has received €25 million from the European Commission under its Horizon 2020 programme, following a request in November. It was officially launched on 1 May. For its part of the project, Principle Power will design a floating foundation capable of support a double-digit-megawatt size turbine. The pan-European project — called ReaLCoE or Robust, Reliable and Large Offshore Wind Energy Converters for Clean, Low Cost and Competitive Electricity — has 14 major stakeholders, including Senvion, ABB, DNV GL, EnBW, Jan de Nul, Ingeteam, Wood Group, and the Danish Technical University (DTU). 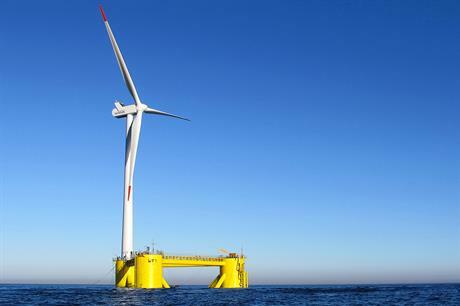 The project plans to establish a pre-series turbine array in a real offshore environment by 2021. Principle's WindFLoat floating foundation for deep-water was piloted in a 2MW project off Portugal between 2011 and 2016. Senvion teased the launch of a 10MW+ offshore wind turbine at the AWEA Windpower 2017 show in California, but further details since then have not emerged. Following the unveiling of GE Renewable Energy's 12MW offshore wind turbine in February, and with industry leaders Siemens Gamesa and MHI Vestas already selling 9MW+ models, Senvion is at risk of falling behind the competition with its 6.3MW turbine the largest capacity on offer.